Other Products by Body Science. Search other Plant Protein Powder products. Bodyscience have come up with the goods once again! These guys truly are prolific when it comes to innovative nutritional formulations. Clean Vegan Protein is the 100% plant-based protein powder that we've all been waiting for ... in 4 enticing flavours. 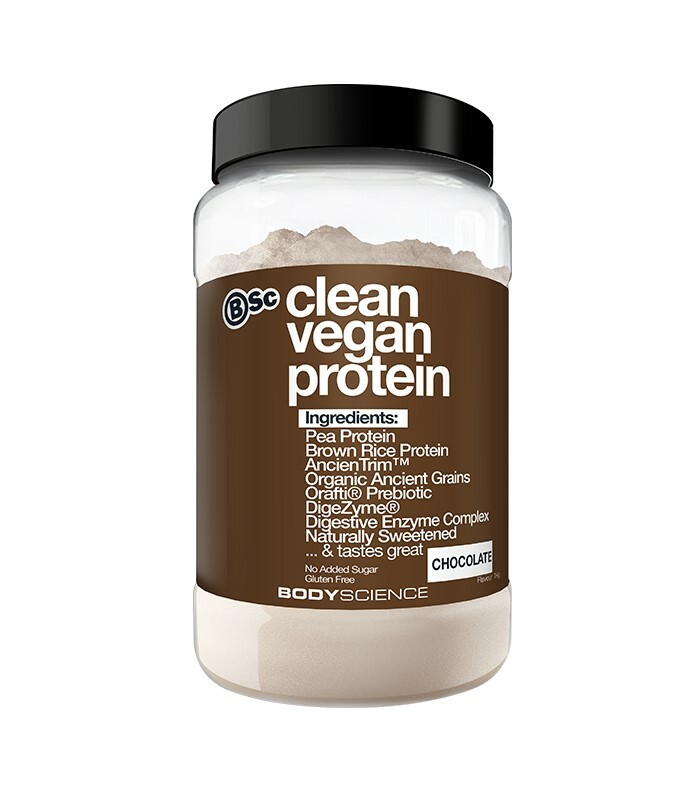 Bodyscience Clean Vegan Protein contains a blend of VEGAN SUITABLE pea protein isolate and brown rice protein. This means you won't be sacrificing recovery time or general nutrition if you're switching from a traditional whey protein. And if you've always been on plant-based products, then you know this already! Back in the days when plant based proteins raised a sceptical eyebrow from whey protein enthusiasts, the pickings were always pretty slim. Usually there were only a couple of dusty tubs hanging around in dark corners of health food stores. BUT NOT ANYMORE! With scientific research forging new paths and consumer awareness growing in leaps and bounds, leading sports nutrition companies like BODYSCIENCE are backing the plant-based cause whole-heartedly. Now, with CLEAN VEGAN PROTEIN, we have Salted Caramel, Berry Coconut, Chocolate and Vanilla to choose from. Not only is it exceptional quality, but we've got some awesome flavours too. Aren't we blessed? Pea protein isolate and brown rice protein have both demonstrated some remarkable results when compared to whey protein. For instance, pea protein isolate was as effective as whey protein in promoting muscle thickness1. Now, if you're not into thick muscles, FEAR NOT! The participants of this clinical trial were engaged in the type of resistance exercise that encourages the body to thicken its muscle, with proper nutrition of course. Quality protein powders, like pea protein, help our body adapt to the exercise that we engage in. For instance, if we regularly perform high repitition weight lifting using moderate weights, quality protein will assist our body in responding to that exercise, which in this case would typically lead to improved muscle tone, and perhaps a small amount of muscle accrual in time. In fact, qualty plant based protein supports recovery from all types of exercise, and can even be taken when sedentary if the diet is lacking in protein food. After all, the essential amino acids do a great deal more for us than support muscle growth. Rice protein has also been put to the test. One paper indicated that compared to whey protein, rice protein was equally as effective at improving body composition and performance when the supplement was taken after exercise2. This means, we can rest assured that our natural amino acids needs are fully accounted for with each shake of Bodyscience Clean Vegan Protein. It contains all of the essential amino acids, 3 of which are the Branched Chain Amino Acids, plus a range of conditionally and non-essential amino acids. To top it all off, Bodyscience have included a range of digestive enzymes. This ensures that the protein is broken down in the digestive tract and supports amino acid absorption. Whether you're wanting to supplement a plant-based diet that could do with a protein infusion, or just after a new protein powder to try, Bodyscience Clean Vegan Protein is a fantastic option that will improve your nutritional status quick-smart. All hail the humble pea! Add 45g (approximately 5 heaped tablespoons) to 250-300ml water and mix in shaker or blender. Consume immediately. INGREDIENTS: Vegan Protein Blend (Pea Protein Isolate, Brown Rice Protein), Orafti(R) Prebiotic Inulin, Natural Vanilla Flavour, Natural Caramel Flavour, AncienTrim(TM), Organic Ancient Grains (Amaranth, Quinoa, Buckwheat, Millet, Chia), Digezyme(R) Digestive Enzymes (Amylase, Protease, Cellulase, Lipase, Lactase), Stevia, Thaumatin. INGREDIENTS: Vegan Protein Blend (Pea Protein Isolate, Brown Rice Protein), Orafti(R) Prebiotic Inulin, Cocoa Powder, Natural Vanilla Flavour, Stevia, Thaumatin, AncienTrim(TM), Organic Ancient Grains (Amaranth, Quinoa, Buckwheat, Millet, Chia), Digezyme(R) Digestive Enzymes (Amylase, Protease, Cellulase, Lipase, Lactase). INGREDIENTS: Vegan Protein Blend (Pea Protein Isolate, Brown Rice Protein), Orafti(R) Prebiotic Inulin, Natural Caramel Flavour, Himalayan Salt, Natural Hokey Pokey Honeycomb Flavour, Natural Vanilla Flavour, AncienTrim(TM), Organic Ancient Grains (Amaranth, Quinoa, Buckwheat, Millet, Chia), Digezyme(R) Digestive Enzymes (Amylase, Protease, Cellulase, Lipase, Lactase), Stevia, Thaumatin. INGREDIENTS: Vegan Protein Blend (Pea Protein Isolate, Brown Rice Protein), Orafti(R) Prebiotic Inulin, Natural Strawberry Flavour, Natural Coconut Flavour, Stevia, AncienTrim(TM), Organic Ancient Grains (Amaranth, Quinoa, Buckwheat, Millet, Chia), Digezyme(R) Digestive Enzymes (Amylase, Protease, Cellulase, Lipase, Lactase), Thaumatin.